CHAPEL HILL, NC— Bain and Company, a Boston-based business consulting firm, held its annual case race competition for UNC-Chapel Hill students last Friday. Teams of participants devised and demonstrated strategies to drink a case of beer in the least amount of time possible. In the first round of the competition, twenty student teams spent a week preparing a fifteen minute presentation of the fastest way for three people to finish a 24-pack beer of Keystone Light. Competitors were told to make educated assumptions about certain key data points as they worked to provide innovative solutions to the problem and then enact them during the presentation. Many competitors echoed Chu’s assessment, and most said they expected parity among the case race teams. Many of the teams reported putting in long hours in the days before the final presentation. In the first round, teams demonstrated their case race strategies to a panel of Kenan-Flagler professors, which selected the three strongest teams to demonstrate before a panel of Bain executives, as well as an executive of Coors Brewing Company, the parent company of Keystone Light. The final round took place in an auditorium in Kenan-Flagler business school. The three final teams gathered around 24-count cases of Keystone Light sitting on folding tables. Their Powerpoints were behind them, ready to display graphs, case studies, and an impressive array of appendix slides. The beer was at room temperature, as the teams requested, so that it would sit lighter on the stomach. The race began with all teams shotgunning, leaving the suits and ties of the competitors soaked. 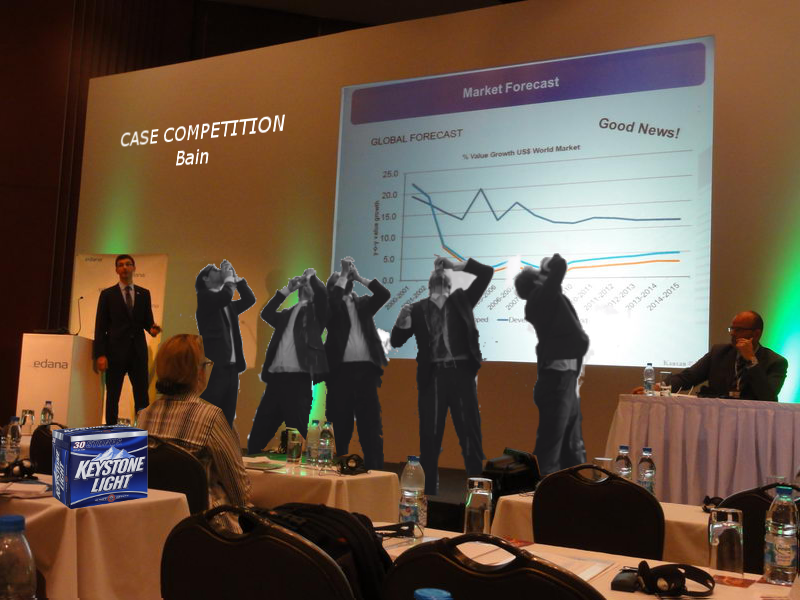 The teams remained neck-and-neck until the competitors reached their fourth beer, when Jack Henson stumbled to the edge of the stage and vomited. His team was disqualified and his exit was met by contemptuous looks from the panel. Karen Walker, a partner a the firm who was judging the contest, said it was a disappointing ending to a promising presentation. Jason Merill, Aaron Pierce, and Daniel Wingrave won the case competition, showcasing their ability to down the Keystone Light case in a tight 35 minutes. For their performance, the three were presented with honorary gift cards to the Chapel Hill bar Pantana Bob’s, which Bain officials said they hoped would help the students”keep up the good work” until they graduated. While Bain officials would not say whether they had further plans for the winning young men, they indicated that outstanding performance in the case competition would weigh favorably when it came to offering interviews for junior associate positions with the company. “In the real world, we mainly do blow,” he added.